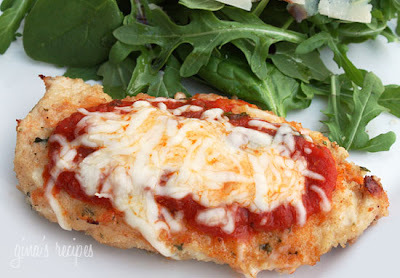 Ok, one of C's favorite meals is Chicken Parmesan, thus I have been searching for a great recipe to make this a bit healthier.. I should of known to search Skinny Taste first becuase Gina always comes thru for me! Here's an Italian classic made lighter. Baking the cutlet as opposed to frying really lightens this dish up while remaining moist and full of flavor. Lightly spray a little more cooking oil on top and bake in the oven for 20 minutes. Turn chicken over, bake another 5 minutes. Remove from oven, spoon sauce over chicken and top with shredded cheese. Bake 5 more minutes or until cheese is melted.